The Plot In a post-apocalyptic American Frontier, a lone soldier fends off a brutal warmonger to rescue a girl fated as the savior of humanity. Our hero joins forces with a cynical veteran and a slimy thief to bring the girl to safety, encountering mysterious invaders and traveling showmen along the way. 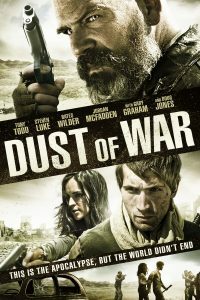 The Look Dust of War can be billed as a South Dakota flavored Mad Max, infused with the earthy textures of Dances With Wolves and the stark beauty of Ingmar Bergman's The Seventh Seal. South Dakota's savagely beautiful landscape will serve as the perfect backdrop to a classic action-adventure picture.